Over the years, Nancy recorded at least six programs on sewing scarves. Going through the Sewing With Nancy archives and revisiting those techniques reminded us that most scarf styles are timeless. Today Team Nancy Zieman spotlights the second episode of Favorite Scarves to Sew, where you’ll see videos, showcasing scarf techniques that have stood the test of time. Whether you’re a newcomer or seasoned viewer of Sewing With Nancy, we’re certain there’s a scarf style that will pique your interest. Let’s start with the Loop & Tuck Scarf. With only a yard of fabric and a little sewing time, you can easily create an accessory that always stays in place. The essential ingredient can be found in the way the pattern is designed; there will be no slipping or sliding of the scarf once it’s looped and tucked! Different fabrics, different looks—that statement couldn’t be more obvious when looking at these two scarf options. Even though the same pattern was used, the edge finish plus the fabric choice change this scarf from elegant to casual. It’s called an S-Curve Scarf. The scarf pattern pieces resemble two large donut shapes—it must seem odd, but the results are anything but! Wonder how it’s made? Just watch. We think you’ll be surprised! If you’ve been itching to sew, but hesitate because you don’t think you have the time, make a “Knot Your Average Scarf.” In fact, this scarf can be made in a little over an hour. Featured is a knit version of the scarf in two coordinating colors—you could also select woven fabrics if you’d like. The first step is to sew tubes, and Nancy will show you how to create the knot. Then, a little more sewing and presto, a completed scarf. It’s creativity with instant success! On set, Nancy joked, “If I owned a convertible, I’d choose a hot pink number, buy a big floppy hat, and wear this scarf cavalierly around my neck!” She settled for wearing this scarf while driving her mini van. If you’re in need of a mental getaway, choose a pretty print organza, a coordinating solid, and a touch of ribbon. This easy-to-sew scarf has daydreaming possibilities. If you own a serger, the Double De-Lite Scarf is for you. Choose two compatible lightweight fabrics such as organza or organdy, cut bias strips, serge the edges, and after stacking and sewing the layers together, you’ll find that you’ve created a flowing, graceful neck wrap. Make it long as featured, or shortened as your taste guides you—you’re the designer, so make it your own. The sewing and serging processes are extremely enjoyable and the finished scarf creates a stunning frame for your face. Team Nancy Zieman’s goal in presenting clips from previous Sewing With Nancy programs showcasing scarves, is to tell the story that the techniques of sewing scarves are almost timeless yet fulfill our need to be creative. With instructions for over 40 different scarf variations, find the design that is perfect for your wardrobe. Fleece, rayon batiks, interlock knits, jersey, and homespun—these fabrics, plus many more, are candidates for your next scarf creation. Scarves can be created with a minimum of time and monetary investment. The best part is turning a rectangle of fabric into a fashionable accessory! For a chance to win a copy of the book, Sewing With Nancy’s Favorite Scarves to Sew from Nancy’s Notions, let us know what scarf you’re planning to sew and freshen up your winter wardrobe. I would make a Knot Your Average Scarf! I love cowls, and have already made a fleece cowel using that pattern, minus the knot part. The S Curve scarf would be perfect for spring. I have made few but one can never have too many scarves! I would love to win this give-away! I love the S curve scarf. It is so unique and can be made to look elegant or casual depending your fabric choice. I would make the Double de-lite scarf. It is very pretty. I’m thinking at this point I need to figure out light and airy scarves for spring since I have all the winter things I need. The S-curve one looks so pretty! I’m thinking of a nice Fleece Scarf, it’s been so cold here this winter I need a some fleece to help keep me warm. Nancy has such fun scarfs. I’m wanting to try the infinity knot scarf and the fringe scarf. Thank you for the opportunity to win this book! i would love to try the double de-lite scarf. Any time I can use my serger more, I’m all in. I’ve made a few of the spiral scarves, they’re fun to sew. The loop and tuck scarf looks interesting to me, I’d like to try that one for Spring. I would probably make another infinity scarf I like them so much. I’d start with the Knot Your Average Scarf! The convertible ride scarf is gorgeous. i’d make that first. What lovely scarves! The Loop & Tuck Scarf is definitely one I would like to add to my accessories. I would love a scarf to stay in place! Loop and Tuck for me! I really liked the S curve scarf. Very elegant. So many wonderful scarves! I love Nancy’s convertible scarf, and I would probably also make her loop and tuck scarf. Double Delight. Miss watching you on tv. Thanks so much for all the information you shared. “Knot Your Average Scarf” looks like a winner to me! Easy to wear, adds warmth to the back of the neck, and adds color to an outfit. The loop and tuck scarf seems like a practical choice for a winter wardrobe and also an opportunity to add a “taste” of spring to it through bright, cheery color choices. All the scarves are really good to make. I like the Knot Your Average Scarf. I am hoping some of these scarves can be made by a newbie sewer. I just had a total thyroidectomy, so I now have a large scar which I also have to protect from sun, so I have a new-found interest in scarves! The pendant scarf looks lovely and unique, but many would work for me. To spruce up my winter attire, I think that the “Knot your average scarf” two tone scarf would be my first choice. Since the make up so fast I could make one to match my coat and one or two to match my favorite winter sweaters as a way to spruce up my office attire at the same time. Knot your average scarf is perfect for some fabric I have on hand. I want to shop for fabric to make Double Delight. I love watching Nancy sewing and teaching us! Thanks for keeping her work available to all of us – newbies to experienced. I really like the s curve scarf. I even have the fabric -organza I purchased at an estate sale. All of the scarves are beautiful. However, my favorite scarf is the chenille scarf. I have watched Nancy and her guest make that scarf on multiple occasions starting with the original airing on Sewing with Nancy and many repeats of the show. I have also watch the demonstration from the web site. I can imagine the softness of the scarf and the joy it would bring to wear it. I like to wear a necklace on top of a scarf so the pendent scarf would fir the bill. Infinity scarves are always great. The hoop and loop scarf looks good too. I love these scarves. One can not have too many. I would like to make the Loop and Tuck Scarf. “No slipping or sliding” of the scarf sounds good to me. Thank you for the great giveaway! 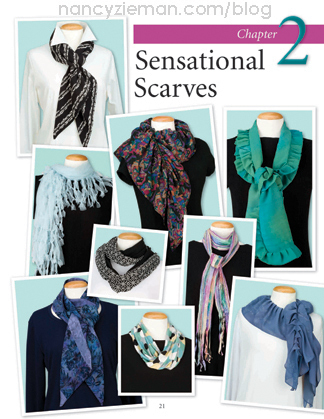 I want the Double Delite and the S Curve to add to my scarf collection. Can’t get better than getting those from Team Nancy. Thanks!! I want to sew the double de-lite scarf.